There is a wealth of testing practice available that can help you prepare for any high stakes tests, including tutoring agencies, online practice tests, and personal tutors. Utilizing one of these programs will get you the repetition and practice you need for the big day. Just like anything in life, practice makes perfect, and if you want to perfect that score, you need consistent practice. Reading to education is like weightlifting to football. The more you read, the stronger your brain becomes. High stakes standardized tests require complex thinking, and the brain needs to be exercised in order to carry out that task. Reading will give the brain the exercise it needs to think through challenging questions. A strong vocabulary is crucial to passing high stakes test. Be it the need for domain specific vocabulary, jargon related to a field, or simply vocabulary to sound intelligent, you need to pay close attention to the words that those around you use. One way to do this is to listen to the words used in pop culture or in the media. News reports are chockfull of great words that act as grace notes — the exact right word. Begin to ask yourself, “What connotation did the word carry to make it the right word?” You will begin to see the nuances in language, and it will help you tremendously when it comes to taking those high stakes standardized tests. 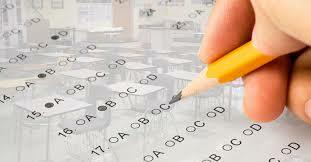 One thing that many people struggle with when it comes to standardized tests is question reading. Many people begin to read the question and then skim through the rest assuming they know what the question was asking. If you catch yourself doing this, keep this in mind: Test takers know you do this, so they write questions to catch people who do this. Take your time, read the question fully, and then answer the question. If you know you are a person who skims and then responds, practice reading test questions so that you can train your brain to slow down. Do not spend too much time stressing over one question. Time is valuable when it comes to high stakes standardized tests, so if you have to move on, do so. If you spend too much time stressing over one answer, you could run out of time and miss questions you could have easily answered. Move on and come back. In order to apply to many of the colleges and universities in the U.S. News Best Colleges rankings, students must first take the SAT or the ACT. The standardized tests gauge college readiness by focusing on areas including math and reading—which, for international students, can sometimes be tricky. Here are five tips to help you master the tests. 1. Fine tune your English: Since both the SAT and the ACT have sections that require English abilities, it’s “ineffective and inefficient” for non-native English speakers to prepare without first mastering the language, says Sam Hwang, founder and CEO of New Pathway Education and Technology, a test prep company founded in Shanghai. He recommends studying first for the Test of English as a Foreign Language (TOEFL), and not moving on to SAT or ACT training until scoring at least 90 (out of 120) on the Internet-based exam. Even if you know English, make sure you’re familiar with American English, recommends Prince Abudu, a student from Zimbabwe who’s studying at Morehouse College in Atlanta. For Abudu, who studied British English growing up, reading essays online helped him to understand the nuances of American English as he prepared for the reading and writing sections of the SAT. 2. Work on understanding context: Simply being able to read in English won’t likely be sufficient for the SAT, in particular, which requires students to process and comprehend information. Students can also expand their vocabulary by studying lists of the most common words used on the SAT, for instance—offered online or through test companies including Veritas Prep. Terms such as “amicable” are often tested but may not pop up in students’ everyday conversations, Small notes. 3. Focus on your weaknesses: In Small’s experience, international students might master the quantitative parts of the SAT in half the time Americans do, but could take twice as long to feel comfortable with the reading and writing sections. Allot significant time to boosting your confidence in areas that are tough for you, he recommends. 4. Master the test structure: Whether you choose to take the SAT or the ACT, it’s important to understand the makeup of the tests, Abudu of Morehouse College says. The SAT includes three timed sections: reading comprehension, writing, and math, while the ACT has four components, including science, and an optional writing portion. By taking practice tests, Abudu and fellow Zimbabwean and Morehouse College student Abel Gumbo learned the structure of the SAT and felt more comfortable performing in the time allotted for each component, they say. 5. Set a goal: For an extra boost while preparing, try to remember why you want to go to a U.S. college in the first place. For Gumbo, picturing his computer science courses in the United States, which he notes is more technologically advanced than Zimbabwe, pushed him to stay on track. “I knew that I could not fail the SATs because I needed to go to the United States,” Gumbo says. “It motivated me to study more so I could get a really high score.”Networking with future classmates is one way new MBA candidates can get a jump start on the school year.